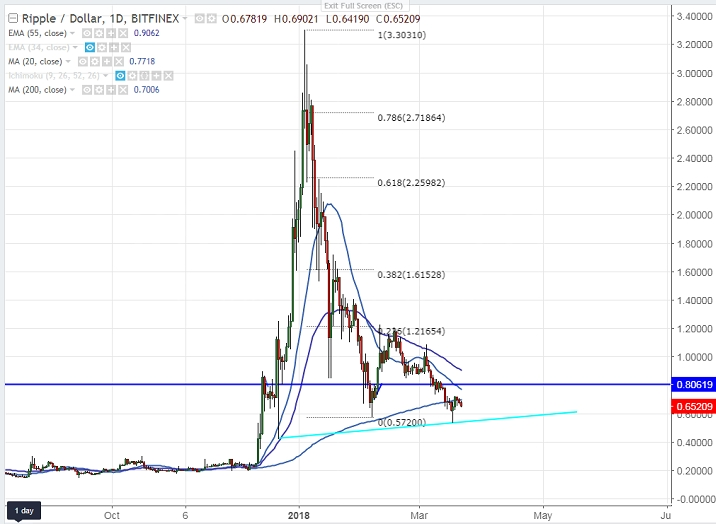 Ripple is trading weak after hitting high of 0.7250 on Monday. The pair has declined slightly till 0.64190 from the high and is currently trading around 0.65109. Any break above 0.7250 confirms minor bullishness, a jump till 0.7800/0.85/0.9055 (50- day MA)/1/1.0275. Any close above 1.0850 will take the pair to next level till 1.200/1.2280. Short term bullishness only above 2.25 level. The near term support is around 0.6500 and any break below will drag the pair down till targets 0.6000. Major support at 0.490 (233-day MA) is last hopes for bulls. Any violation below will drag the pair till 0.25/0.15 level. The near term support is around 0.87/0.61. It is good to buy on dips around 0.6000 with SL around 0.500 for the TP of 0.85/1.